At WUWT today (archived here), Anthony Watts has discovered a new paper in the Lancet from a tip from a denier. The paper is a massive analysis of mortality in many different countries, but states it cannot be considered a global study (it doesn't include Africa or the Middle East for example). The authors analysed mortality in different weather - hot and cold. Risk increases slowly and linearly for cold temperatures below the minimum mortality temperature, although some locations (eg, London and Madrid) showed a higher increase for extreme cold than did the others. By contrast, risk generally escalated quickly and non-linearly at high temperatures. Again, notice how the number of deaths from cold go down gradually but spike much more sharply when it gets hot. It shouldn't come as a surprise that since 1985 around the world in the places the researchers studied, there would be many more deaths during cold weather than hot weather. That doesn't mean, as Anthony Watts will have you think, that we can be complacent about the prospect of temperatures hitting 40C plus for days on end, with nights not getting much cooler. Peak heat stress, quantified by the wetbulb temperature TW, is surprisingly similar across diverse climates today. TW never exceeds 31 °C. Any exceedence of 35 °C for extended periods should induce hyperthermia in humans and other mammals, as dissipation of metabolic heat becomes impossible. While this never happens now, it would begin to occur with global-mean warming of about 7 °C, calling the habitability of some regions into question. With 11–12 °C warming, such regions would spread to encompass the majority of the human population as currently distributed. 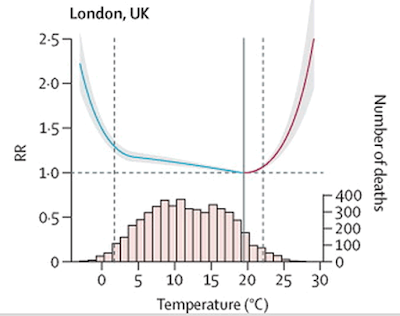 Eventual warmings of 12 °C are possible from fossil fuel burning. One implication is that recent estimates of the costs of unmitigated climate change are too low unless the range of possible warming can somehow be narrowed. Heat stress also may help explain trends in the mammalian fossil record. Don't leave it there. For a good perspective on the paper from the point of view of global warming, go and read Greg Laden's article. Anthony Watts finally found a paper that isn't a "claim"! What? No "claim" in the headline this time around? Has Anthony finally discovered a scientific paper that he doesn't dispute? Wonder of wonders. And what, may I ask, was this “optimal temperature”? Finally he did go back to the paper and discovered that the optimum temperature is different for different locations - surprise surprise (not). It's the temperature at which there is minimal mortality. Neither hot nor cold kills if your prepared. I live in an area with a pretty hostile winter climate, and the number of people that die due to anything but their own stupidity is, approximately, zero. The problem with cold weather is that it takes more resources to survive, and if you’re caught without them you are doomed as doomed can be. With heat all you need is a bottle of water, a bit of shade, and the sense to sit down and quit. Survival means nothing more than looking at the extreme events in the area where you live, and preparing for them. Plus or minus a few degrees on a global scale seems pretty meaningless. There are only ten "thoughts" so far. If we wait for a bit it probably won't be long before someone comes up with the idea that everyone in Africa can buy an air-conditioner for the heat. There's already someone talking about "fuel poverty" and I expect a lot more comments like that will surface as well. So far no-one at WUWT has twigged that the body responds differently to cold than it does to heat, or that heat kills a lot more quickly. Interesting. I can't help thinking that if the average temperature goes up a few degrees, the number of days above the optimum is going to increase substantially (we've all seen the graphs for that) and the large number of days below the optimum weights the past deaths more to the cold side. 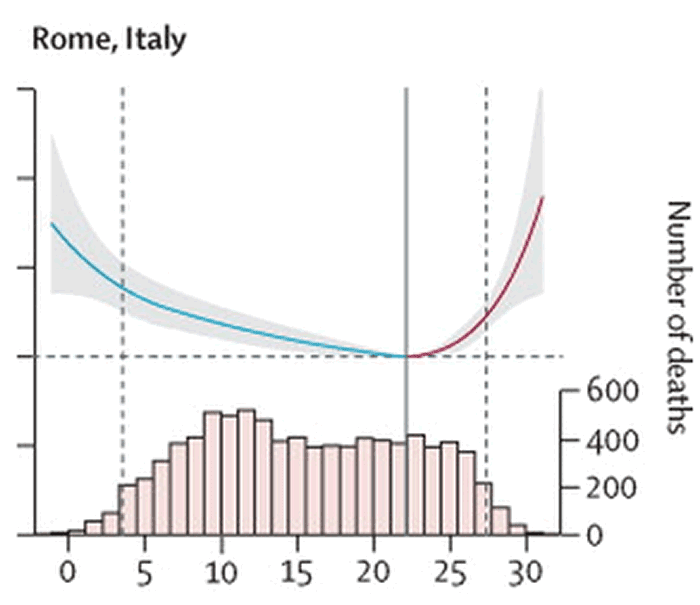 So, even though a few degrees rise in average temperatures would reduce the larger numbers of deaths due to moderate cold, looking at it just within the limitations of this data set, substantially increasing the number of days above the optimum, combined with the greater escalation of risk above the optimum point, could easily result in the total number of deaths remaining unchanged. Even if it doesn't increase, it may be unlikely to decrease. You'd have to do a new study to work out the likely effects. Obviously this ignores the limitations of this data set, as noted in Laden's article, and ignores all the other detrimental effects of higher temperature. And on the subject of Watts, is he now arguing that climate change is happening? I ask merely because if he's banging on about higher temperatures being better, that would imply an acceptance of climate science. BTW sorry for the delay - Google has a mind of its own. I think many deniers use the "everything including the kitchen sink" approach. If they can twist it so it appears to support their position they'll use it regardless of how much it contradicts other arguments they've used. They use everything in the hope that something sticks. One of the reasons that many deniers don't grok the seriousness of heat stress is laziness. ANd I don't just mean intellectual laziness, I'm referring to physical laziness. Most modern Western humans sit on their arses far more than evolution intended, and use fossil energy to do what ATP is supposed to do. Consequently most people don't generate the sort of heat bursts that a biophysically-functional human should be generating, and with which non-human animals have always had to contend. Sherwood's and Huber's paper made an important point at the time about physiological tolerance of extreme heat events. It seems that the lesson still hasn't disseminated widely, especially as many denialists think that the issue is with mean temperature increase rather than extreme temperature events - as with many environmental insults it's usually not the press events that catastrophically terminate populations, but the occasional intolerable pulses. And the intolerable heat pulses are becoming more frequent and more extreme, in exponential proportion to the increase in mean global temperature. The calculus that arises is simple. I don't think it's just laziness. I think a large part of the problem is that the whole thing is counter-intuitive. If the world is only going to be "a little bit warmer", then people instinctively think that this will only be "a little bit of a bother". They just don't understand the feedbacks and escalations that will result. In the original article, it appears that classic heat waves (hot nights are incorporated in 24 hour temperatures, but also presumably with duration and humidity) are included with the extremes (97.5 percentile). Forgive my prejudice, living in a dry heat, and facing another summer's comfortable confinement within air conditioning; but I expect that the humidity plays an important role, which will have to await the next paper. Their total ought to be ignored, as it isn't representative of anything meaningful, but the details are interesting. Especially the supplementary materials, which has graphs for every location and some useful regional charts. One striking feature of the graphs is that most cold Northern sites (Canada, Sweden, Northern US) have very flat cold weather RR curves. Shifting Montreal warmer won't change the cold RR much at all, but looks to increase the hot RR rapidly. Apparently wealthy Northern climes have effective adaptations to cold weather, so mortality there won't benefit much from a reduction in cold extremes. OTOH, places like Okinawa, Hong Kong, Palermo, etc. have a doubling of RR at lows of 5C or 10C, where Montreal is flat down to -20C, so they aren't as well adapted/prepared for cool weather. Looking at Table S3 (mortality fraction by country by temperature percentile range), the cold weather mortality for most locations is pretty evenly distributed in a broad range up to the 50th cold percentile. 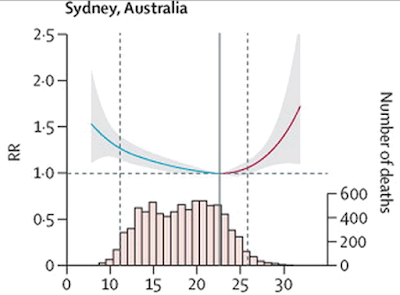 On the hot end, the mortality is heavily clustered above the top 90th percentile, so a shift upwards could conceivably increase hot weather mortality more than it decreases cold weather mortality. Of course, it isn't that simple, as changing conditions will change the resource allocation for adaptation. Especially in poorer countries, that could mean less resources available for cold weather adaptation, so it's possible warming could increase cold weather mortality in some regions. The shapes of the relative risk and adaptation cost curves really do matter.